Longest running equestrian riding academy in GTA (since 1979). Qualified instructors accredited by OCA & OEF. Teaching English riding to beginner, intermediate & advanced levels all year long with a positive, hands-on approach to horsemanship and riding. Large indoor & outdoor rings on 10 rolling acres, arts & crafts barn, in-ground pool, certified lifeguard, plus 24 horses! Daily busing is available from Toronto & York Region (5 stops). Email to arrange a Free Tour of our facilities, or check our website for Open House dates. FREE TOUR! Come visit the farm and horses! Established over 40 years in the GTA, Whitchurch Riding Academy provides safe, inclusive horseback riding lessons for adults and children, plus a summer riding camp for beginner, intermediate, and advanced riders. Located east of Newmarket, facilities include horses for every level of rider, an indoor riding arena, outdoor rings, heated viewing lounge, plus busing and in-ground swimming pool for our summer camp program! Fully accredited by the Ontario Equestrian Federation (OEF), and the Ontario Camps Association (OCA). You have an amazing riding camp program and my daughter had a fabulous time. She can't wait to come back next summer. Not only have you provided great memories for her, you provided me with peace of mind with all your safety protocols. Not once did I worry about her while she was attending your camp. I will be highly recommending your program to all my friends. I was totally impressed with the comfort the girls demonstrated around the horses, and the skills they had in controlling their movement. The girls have completely enjoyed their experience this week at Whitchurch Riding Camp. I'm sure they'll ask to return next summer. We wanted to pass on our thanks to you and your staff for the great visit today at riding camp. It was terrific to see how smoothly everyone worked together and we were amazed with how well our daughter Georgia was doing! Your counselor, Jaime, was a pleasure to meet, and she and Georgia have a lovely connection. We appreciate the opportunity to visit. Thanks again. Thank you so much for an amazing two weeks at Whitchurch Riding Camp. I only started riding this summer and it was a great experience. I love being around horses and the staff were so nice that it was truly enjoyable. This is something I will remember forever. Being in the advanced group for the second week made me work hard and taught me how to care for my horse. You do an amazing job with the horses and I thank you for letting me be a part of this camp. 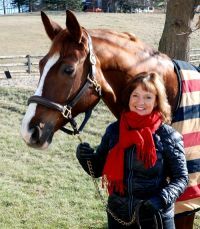 Successfully competing and teaching many disciplines, Dianne completed the Equine Studies Program at Humber College, and was short-listed for the Canadian Pan-Am Dressage Trials. She founded WRA in 1979. Having taught riding for over 40 years, it is rewarding to now see past campers return as accomplished and happy adults, successful in a wide variety of fields. They have such fond memories of summer riding camp, the horses and counselors, and how it affected their lives in such a positive way. That's why I am so proud to continue with the tradition of providing a safe, positive, and inclusive learning experience when it comes to horseback riding. I was totally impressed with the comfort the girls demonstrated around the horses,; and the skills they had in controlling their movement. The girls have completely enjoyed their experience this week at Whitchurch Riding Camp. I'm sure they'll ask to return next summer. You have an amazing camp program and my daughter had a fabulous time. She can't wait to come back next summer. Not only have you provided great memories for her, you provided me with peace of mind with all your safety protocols. Not once did I worry about her while she was attending your camp. I will be highly recommending your program to all my friends. 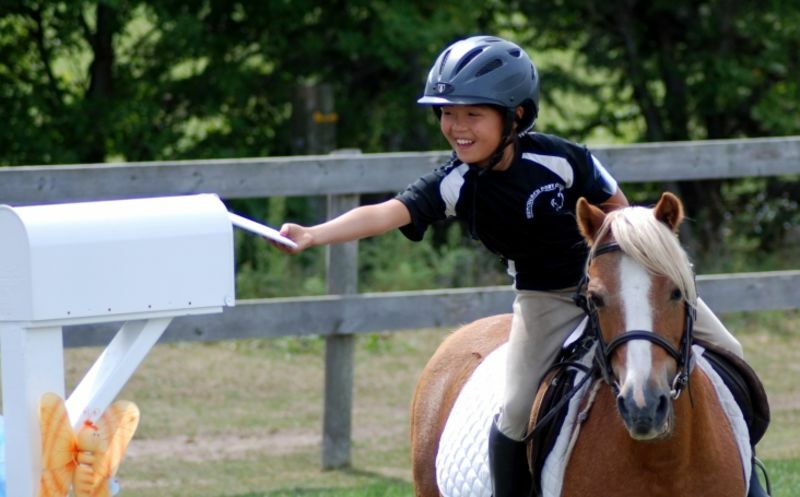 Whitchurch Riding Academy Inc. located just east of Newmarket, has been home to York Region's longest established Summer Riding Camp. For over thirty-five years we have provided a complete riding experience for children of all levels, beginner to advanced. Activities include a one-hour English riding lesson, horsemanship, arts & crafts, swimming, games & singsongs. Our Facilities include trained horses, indoor sand riding ring, outdoor (fenced) sand riding rings, large arts & crafts barn, rainy day activities, indoor lunch area, port-a-pot toilets, and an in-ground supervised pool. Our Advanced Camp includes an additional hour of riding every day, dressage, jumping, hacking, mounted games, presentation skills, advanced horsemanship, counselor-in-training program. To get to day camp, school-buses are provided from five convenient pick-up points in Toronto and York Region. Campers can also be dropped off directly at riding camp. We have lessons all year long! Whitchurch Riding Academy Inc. is accredited by the Ontario Camps Association (OCA), and the Ontario Equestrain Federation (OEF), and provides private, semi-private, and group lessons all year long. Don't forget to pack a lunch and snack, bring a hat, protective sun gear, swimsuit, riding helmet, boots with a heel. Our qualified riding instructors are certified in first aid & CPR. All horses are schooled to ensure your child's safety. A NLS Certified Guard supervises pool activities the entire day. The things I liked about camp were the riding (obviously), the crafts, the games and the counsellors were very nice too. The horses were great too. I think you should bring back Bullwinkle (I love him! ), Beau and a couple of others. I first attended Whitchurch Riding Camp when I was 8 years old. I remember getting all excited to go and ride a horse for the first time in my life! Before this the only encounters I had with horses were seeing them in the field. I arrived at camp extremely excited but also nervous since I didnât know anyone. The moment I got off the bus I was welcomed by amazing counselors who made my camp experience the greatest. Within a day of being at camp I felt right at home and had made many new friends. When I first attended Whitchurch Riding Camp I knew nothing about horses. I came with my bicycle helmet, some tight pants, and some leather boots with a heel. Who knew that after getting off that bus and then getting on a horse that I would become passionate about horses? Everyday I would come home from camp and have a different story to tell. It wasnt just the horses but the swimming, arts and crafts, the games, the counselors, and most of all the sleepovers. After experiencing camp for the first time when I was eight years old, I have spent every summer there for the past 10 years. I became addicted to camp. I moved on from being a camper to being a volunteer/counselor-in-training. While being a volunteer I was able to improve my horse skills and my people skills. Now I have become a counselor and have realized that it can be stressful at times but it is also rewarding to see the campers enjoying the experience of camp as much as I did when I was little. They are always excited to be there and complain when the session is over. It is also exciting to campers improve their riding skills. In many of the campers I see myself, they are becoming passionate about horses just like I was. The experience at Whitchurch has been a very important part of my life as it has become like a second home to me. It is an awesome camp to go to and if you ever do go, I ensure you that you will have a fantastic camp experience. I will always remember my first time at Whitchurch Riding Camp. I lived in the city and had never been near a horse before. I was eight years old and nervous about all the people I would be meeting (as well as the horses). All the counselors and other kids on the bus were very friendly, and after a bus ride filled with songs and games we arrived at the camp, which was sprawling with horses and kids of all ages. There are many fun activities. The morning commences with songs and games in order to help everyone make friends. After being split into smaller groups we did arts and crafts, swimming, lunch, horsemanship and of course riding. In arts and crafts we do creative activities such as paper mache, friendship bracelets and tie dye. Swimming takes place in a large pool with a diving board and change rooms right on site. During lunch we sit outside while watching riding lessons or playing games within our group. Horsemanship allows every level of rider to become more knowledgeable in all different aspects of horse care, including first aid, grooming and show preparation. Riding provides everyone with the chance to learn how to handle a horse in a safe environment. Being a little nervous around horses at first, I quickly found myself becoming confident. As I got older I attended Advanced Camp which includes riding twice a day, counselor training, and my favourite â overnight camp that includes an extra ride and swim, as well as sleeping in the barn and night games. Our group became truly inseparable. I loved coming to Whitchurch Camp so much that I volunteered for weeks at a time. I had taken up lessons at Whitchurch Riding Academy during the year since discovering a real love for riding. I joined the Whitchurch Pony Club and competed at many horse shows and events. Last summer, I was privileged to become a camp counselor after many years of Counselor-In-Training, and I hope to be a counselor for many more years to come. Celebrating 35 Years Of Camp! Interested in Whitchurch Riding Academy?